Key features include kg/lb unit switching, wall mountable display and auto shut off to maximise battery life. 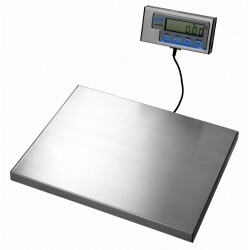 This Salter Brecknell Weighing Scale is perfect for people who intend to use it as a scale for weighing parcels before shipment to determine shipping costs. If you require any additional information regarding any of our weighing scales or would like to talk to somebody regarding any of our scales, please don't hesitate to get in touch.